Yesterday, Lance Armstrong announced that he will no longer be contesting the latest doping allegations levied against him by the United States Anti-Doping Agency, which claimed that he doped and was one of the ringleaders of systematic doping on his Tour-winning teams. According to the World Anti-Doping Code, this decision means he will be stripped of his seven Tour titles, the bronze medal he won at the 2000 Olympics and all other titles, awards and money he won from August 1998 forward. 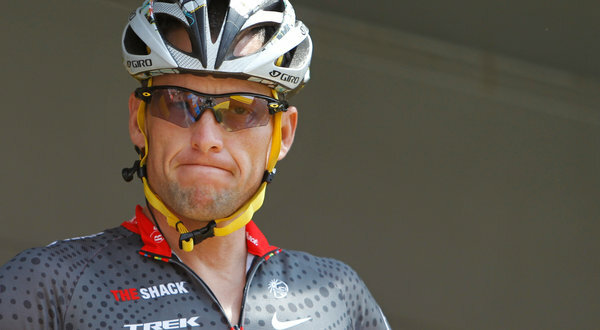 In his official statement, Armstrong continued to deny ever doping, calling the antidoping agency’s case against him “an unconstitutional witch hunt” and saying the process it followed to deal with his matter was “one-sided and unfair.” He drew attention to the 200+ negative results he has passed over the last decade. Armstrong, who turns 41 next month, said he would not contest the charges because it had taken too much of a toll on his family and his work for his cancer foundation, saying he was “finished with this nonsense.” This is certainly an expensive decision in many ways...just paying back the winnings owed could cost in excess of $7 million. But he remains focused on his causes and "being the fittest 40+ year old on the planet". 200+ negative results? I don't know all the details of this ordeal but what authority does the USADA actually have? It's a shame this didn't go to arbitration so the real cheats could be exposed. I'm talking about the people that lied from the inside and covered up positive test results. The riders that raced clean and finished are the real losers in this deal. BTW, it is still possible that LA could keep his titles. The UCI could take the case to CAS and it's possible they could rule not to strip the titles from him. Beside that, who are you going to award them too? Many of the guys that finished on the podium have already served two year bans. Scott, with all due respect, your title doesn't match the story. Lance is not conceding he cheated. To concede is to acknowledge as true. That is not the case here. Title does seem to suggest Lance agrees to the accusations.Think it does seem like a witch hunt,and i can see why Lance would tire of it and try to move on. I agree, basically he is only saying he will not fight this through the USDA arbitration hearing. I have a feeling we are not done with this. It is better to take the high road here and address the bigger issues with the USDA instead of using an arbitration hearing with Lance as the lightening rod. My prediction is that Lance has already made an inside deal with the UCI to keep his tour titles. I would bet just about anything he doped, but so what -- so did the whole peloton. Pretty much anyone who finished on the podium with him, along with many winners after his run have been implicated. There's a fine line between seeking justice and basking in a hero's fall from grace. Very insightful news cast on NPR today regarding this. How about being able to do what Lance was trying to do with his red blood cells but do it LEGALLY!! Oxygen4Energy provides 95% pure oxygen to your lungs. We are also rolling out Vo2, a product that increases red blood cell production (10 yr. gov’t trials). Visit www.oxygen4energy.com/aka and check it our for yourself.